Introduction: Tokay Geckos are the second largest species of geckos with males reaching 11-20 inches in length and females between 7-19 inches. Along with their loud bark, which is where it is said they got their name, tokay geckos are well-known for their often nasty attitudes and painful bites. While captive breeding might help make them better socialized these geckos are not recommended for inexperienced keepers due to their aggressive nature. Housing: These geckos are territorial so it is better to house them individually and males should never be kept in the same enclosure as fights, injuries, and even death could result. An adult, Tokay Gecko needs at least a 24" x 18" x 36" sized enclosure so they have room to climb and explore as well as enough space to create a proper thermal gradient. Tokay Geckos are an arboreal species so branches, vines, and plants (real or fake) should be provided. A few hiding spots can also be beneficial and created from cork bark or half logs. The substrate used needs to hold humidity so some examples include coconut fiber, fir bark, or a potting soil/sand mixture. Since they need a higher humidity it is better to use an aquarium or an enclosure with mostly solid sides versus an entirely mesh container. Temps & Lighting: Ambient enclosure temperatures should range from 75-80 degrees and can drop to 70-75 during the evening. Tokay Geckos, unlike Crested Geckos or Leopard Geckos, need a basking spot of 85-90 degrees which can be achieved using a basking light/heat bulb. As nocturnal animals, tokay geckos do not require UVB lighting but some keepers believe it is beneficial. Naturalistic set-ups with live plants and hollowed out logs and plenty of places to hide are ideal for the tokay. Be sure to monitor the enclosure for fungus and mold, as tokays can be susceptible to fungal infections. Diet: Tokay Geckos can be fed a large variety of insects, and the occasional F/T pinkie, and often have voracious appetites. All insects should be gut-loaded before being fed to your gecko and should be dusted with calcium and a multivitamin. Types of insects safe for tokay geckos include crickets, roaches, superworms, and silkworms. Insects should never be caught from the wild and fed to your animal as they could carry parasites or chemicals. Commercially raised insects are the best and safest option. Adults can be fed 2-3 times a week and babies should be given insects every day. A heavy bowl (so it cannot be tipped over) with chlorine-free water should be available at all times. 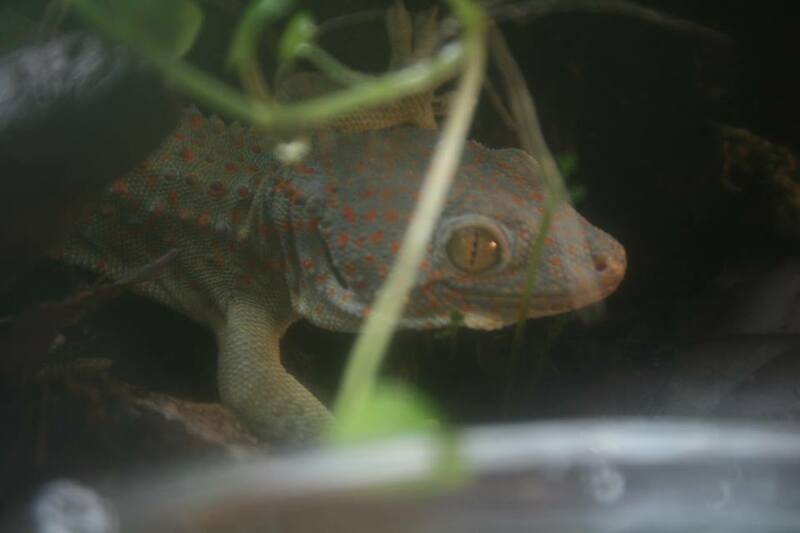 Humidity: Tokay Geckos require higher humidity levels between 70-90%. Misting the enclosure 1-3 times a day should keep the level high enough if the housing and substrate are appropriate but it is best to use a hygrometer to measure to confirm. Be careful to keep the tank and glass free of fungus and mold. In high humidity enclosures this can be a problem, and tokay geckos can be susceptible to fungal infections. For more information on keeping your enclosures mold and fungus free, please see our Cleaning and Disinfecting page.